HE came into governance at a time the fortunes of the state had seriously ebbed and the people embroiled in a gruelling conflict threatening to engulf everyone and everywhere. But Arc. Darius Dickson Ishaku quickly deployed his vast wealth of experience as a successful private sector player to quell the riotous state of affairs in Taraba and set a new tone for peace and development in the state. He also got cognate experience in public sector management when he held sway as Minister of Niger Delta Affairs and went on to combine Power and Environment minister under the administration of President Goodluck Jonathan in 2011. Perhaps, it could be inferred that this rich private and public sector experience is the reason for his very productive two and a half years in the saddle as Governor of Taraba State. Despite the fact that Taraba State belongs to the group of low income earners among states of the federation, it has nonetheless emerged under the governorship of Arc. Ishaku as one of the fastest developing with many projects completed and commissioned within a short span of less than three years. The secret of this outstanding performance is evident in the prudent management of resources which he brought into office from his private sector background. He also came into office with a well defined mission which was clearly outlined in his famous Green Book. The book is a kind of “a-must-do” list of activities intended to rescue Taraba State from the claws of communal crises and the decay of infrastructure. 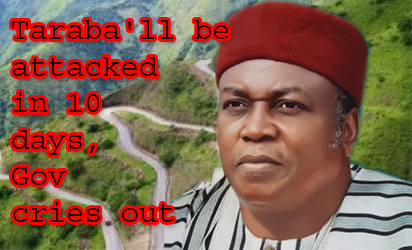 Without mincing words, Governor Ishaku inherited a state that was torn apart by crises. At the time he took over, every senatorial zone in the state had its peculiar case of communal crises. There was also mutual suspicion and many communities that had lived together as good and mutually dependent neighbours became estranged. As a result, farming which is the major engagement of the people, became jeopardised. Similarly, the educational system collapsed as schools were forced to shut down. Consequently, all forms of economic activities collapsed. The first task the government of Governor Ishaku faced was to build bridges across these many inter-ethnic, religious and communal divides to achieve peace and end the frightening state of anarchy. This led to his now famous mantra of “Give me peace and I will give you development.” He physically took the olive branch to all nooks and corners of the state, met with community and traditional leaders and preached peace and the need for people to live together and be good neighbours. The success of this peace mission set the stage for the rapid development of the state that the Ishaku administration is today being credited for. In education, damaged schools were quickly rehabilitated and the school system revived. This recovery has been so rapid and successful that the state has recorded outstanding and unprecedented performances in the West African Examination Council, WAEC, it never did in its 26 years of existence. For example, in 2016, the state scored 67.3 percent in WAEC examination. Before then, the state never exceeded 28 percent in that examination. In 2017, the state took the eighth position in the same examination. That performance was the best in the entire 19 Northern states. To keep the record alive, the governor is still rebuilding and rehabilitating more and more schools. Poverty alleviation through skills acquisition and empowerment of women and youths is a critical part of the Rescue Agenda of the Ishaku administration. This programme has rescued more than a thousand idle young men and women from the poverty bracket. They were trained in various areas and through the skills acquired, they have become not only self-employed but also employers of labour. In addition to the skills they acquired through government-sponsored training programmes, they were also given free start-up equipment to enable them set up their own business quickly and properly. Agriculture is a major emphasis for the Ishaku administration. It has promoted very vigorously wet and dry season farming for various crops, but most especially rice. It has supported farmers through agricultural loans, high yielding seedlings and fertilizer at affordable costs. These very generous farmers support programmes have encouraged farmers to invest more in farming and the results are showing in terms of high and qualitative yields. This has put a lot of money in the pockets of farmers in the state. The administration also established its signature project in agriculture, the “Green House” project which is today the biggest and the best in Nigeria. It is a model farm that employs about 500 people and produces various and special varieties of vegetables that are sold in many department stores in Lagos, Abuja and Port Harcourt. This has reduced dependence of the country on the importation of these products. It was commissioned earlier in the year by Vice President Yemi Osinbajo who described it as the best effort in agricultural technology transfer in the country. Water is another major area of achievement for the administration of Governor Ishaku. His huge investments in the development of water supply facilities have ended perennial water shortage in Jalingo, the state capital. Water dispensing machines have been introduced in the state which has made water supply not only regular but the cheapest in the country. The government is at the moment executing a huge water project that will serve the needs of the state capital for the 30 years no matter the rate of its population growth. The rural areas have also benefitted tremendously from the water supply programmes of the administration. In its first year, the administration provided 100 boreholes in 100 communities which have drastically reduced water scarcity in these communities. These communities had previously relied on streams and ponds for water just like their cows and other animals. Another set of 150 boreholes in 150 communities are currently being drilled to further solve water problem. There are many other bigger water supply projects completed or being executed in all the senatorial zones in the state. Governor Ishaku’s administration inherited 26 government companies that were moribund. It has successfully rehabilitated six of them which are not only functioning but making profits. The Highland Tea produced in Kakara in the Mambilla area of the state is an example. The company’s product has earned recognition and acceptance in the international tea market. What is required is for the company to increase its output to meet local needs and to enter the international tea market. Payment of workers’ salaries and pensions is another area of achievement. In a country where salaries are in arrears for a whole of one year in some states, Taraba State must thumb its chest with pride for paying salaries regularly and as at when due. It is on record that even the December salaries were paid two weeks to Christmas. The post Ishaku: Prudent manager of resources in Taraba appeared first on Vanguard News.